While a movie about giant robots that undergo structural transformations is breaking box office records this summer, a scientific study about structural transformations within single nanocrystals is breaking new ground for the design of novel materials that will serve next-generation energy storage batteries and solar energy harvesting devices. Researchers at the U.S. Department of Energy (DOE)’s Lawrence Berkeley National Laboratory (Berkeley Lab) have reported the first direct observation of structural transformations within a single nanocrystal of copper sulfide, a semiconductor expected to play an important role in future energy technologies. Using TEAM 0.5, one of the world’s most powerful transmission electron microscopes, a research group led by Berkeley Lab director Paul Alivisatos, observed structural fluctuations in a copper sulfide nanocrystal as it transitioned between the low- and high-chalcocite solid-state phases. These fluctuations are highly relevant to understanding such phenomena as how ion transport occurs within electrodes during the charging and discharging of batteries, or how the structures of a solid material might change at the interface between an electrode and an electrolyte. “TEAM 0.5, with its advanced electron optics and recording systems, enables rapid sample imaging with single atom sensitivity across the periodic table and greater collection efficiency. This provides extraordinary opportunities to study structural transformation dynamics in situ with atomic resolution,” Alivisatos says. The popular concept of phase transitions is that of a material, in response to temperature changes, undergoing a transformation from a solid to a liquid or gas, i.e., ice to water to steam. But some solid materials, especially at the nanoscale, when subjected to temperature changes can transition between two more different phases in their crystal structure. Copper sulfide, for example, can be transformed from a complex hexagonal structure known as the low-chalcocite phase, to a more simple hexagonal structure known as the high-chalcocite phase. Because such “first-order structural transformations” can alter the properties of a nanocrystal, they are of great interest to a broad range of scientific fields and hold important implications for numerous technologies. Co-authoring this paper were Haimei Zheng, Jessy Rivest, Timothy Miller, Bryce Sadtler, Aaron Lindenberg, Michael Toney, Lin-Wang Wang and Christian Kisielowski. “During the phase transitions of copper sulfide between low-chalcocite and high-chalcocite structure, the sulfur ions remain in a rigid lattice frame while the copper ions move within the sulfur ion lattice,” says Haimei Zheng, lead and co-corresponding author of the Science paper. According to phase transition theory, a solid crystal will fluctuate between two equilibrium structures near the phase transition point before reaching a stable configuration, and that this region of transition broadens in small crystals. To test this theory, Zheng, Alivisatos and their co-authors zapped copper sulphide nanorods with an electron beam from the TEAM 0.5 microscope then watched for and saw the predicted fluctuations. TEAM stands for Transmission Electron Aberration-corrected Microscope. TEAM 0.5 and its sister instrument TEAM 1.0 are capable of producing images with half angstrom resolution – less than the diameter of a single hydrogen atom. Both microscopes are housed at Berkley Lab in DOE‘s National Center for Electron Microscopy (NCEM). 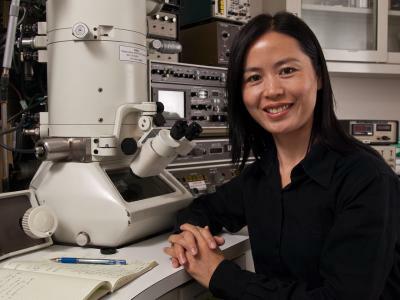 The next step for her, Zheng says, will be to address questions concerning the transport of ions with battery material changes at the electrode/electrolyte interface, and structural changes of nanoparticle catalysts.